TMC V2 VECTON UV15 ULTRA VIOLET WATER STERILISER. YOU ARE LOOKING AT A TMC V2 VECTON UV 15 ULTRA VIOLET WATER STERILISER. USED IN GOOD CONDITION & FULL WORKING ORDER. MAY HAVE MARKS/ SCRATCHES TO THE CASING BUT NOTHING MAJOR. 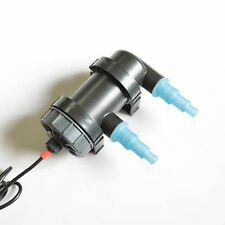 Aquarium Fish Pond Tank UV Sterilizer Filter Clarifier Light Lamp 220-240V 5W. Cable Length. We will provide professional and reasonable solutions for you. 220-240V, 60Hz. Install in vertical or horizontal position right in your aquarium or sump. Great for both fresh and salt water aquarium. 1 x UV Filtration pump. The newly designed pre-filter and quartz sleeve simplify routine maintenance necessary for optimal UV performance. Marine or Freshwater Tank 21 WATT UV Sterilizer. TMC made In England. Dispatched with Royal Mail 1st Class. Marine or Freshwater Tank 21 WATT UV Sterilizer. TMC made In England. The best way to kill harmful bacteria and pathogens in your tank. Condition is Used. The features V2 unit are:-. UV shield to prevent direct viewing of the UV lamp. For aquariums up to approx 600 litres/130 UK gal/160 US gal. 36 uv bulb life. Opposing inlet and outlet for easy installation. Vetus Tweezer Oil & Diesel Pump. Pure Aquarium is also ideal forrestarting an aquarium. The clear and almosttransparent balls are added either directly to the pool or to the filter and slowly dissolve in the water. 1 x UV Light Sterilizer. The germ and algae in the water will be killed when the water under the irradiation of wave length in 253.7nm's ultraviolet radiation in a short period. Suggested mount the unit on aquarium wall vertically under water 1.5-5.0cm depth. $UK Free Shipping Health Protection Free Adaptor Meticulous health protection The integrated ultraviolet germicidal lamp TOP Ultraviolet Sterilizing UV Lamp Light Kill 99.9% Virus Bacteria Mold Mites Germ ( The Product is White Colour ) (The Lamp is 120v, please check your country Voltage before you purchase, or you can get Converter Adapter online to adjust the voltage if your country voltage different.) Applications: Household disinfection lamp UV germicidal help solve the problem of disinfection home life. Particularly suitable for the baby room, the air within the elderly room, kitchen, bathroom, bedroom, and items disinfected. Because UV sterilization strong,Particularly suitable for air-conditioned room or closed window of the bedroom Note: 1, Lamp install and use, do not use too much force. Hands grasp both ends of the tube screwed. AQUALINE ULTRA VIOLET STERILISER. NEW BOXED WITH FITTINGS & INSTRUCTIONS. V2 Vecton 200 Ultraviolet Water Steriliser : TMC. Condition is Used. Dispatched with eBay delivery – Shutl 2-3 days. Fully working but will require a new bulb. Vecton UV 15 External Steriliser For Fish Tank. Comes with recently bought UV Bulb. TMC V2 VECTON 400 ULTRA VIOLET WATER STERILISER. YOU ARE LOOKING AT A TMC V2 VECTON UV 400 ULTRA VIOLET WATER STERILISER. USED IN EXCELLENT CONDITION & FULL WORKING ORDER. MAY HAVE ODD MARKS/ SCRATCHES TO THE CASING BUT NOTHING MAJOR.